Inspired and conceived in France, the Cannelé collection is imbued with a charming sense of Gallic romance. Offered in an array of interpretations, Cannelé is a versatile, enduring collection for all, forever. The Cannelé piece is meticulously hand-set and complemented by a simple and wonderfully comfortable gleaming band. Designed in France and touched by the romance of the place, this unusual ring perfectly blends tradition and modernity, creating a demure yet dazzling piece for whatever occasion. 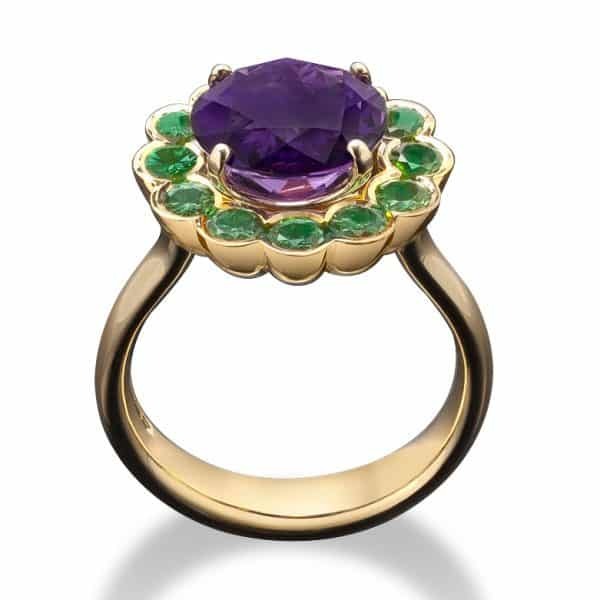 A sublime 4.1ct rich Amethyst and 1.29cts green Tourmalines in the surround – set in 18ct yellow gold. Available in a range of cuts and sizes and in a host of gemstones including diamond, coloured diamond, sapphire and ruby, in platinum or 18ct white, rose or yellow gold.